My name is John King from Nifty and we're here today showing the new Nifty HR17 Hybrid. This is a 50-foot boom. The advantages of it are being very low weight, it's around about 5 tons in weight. We've also got the hybrid power plant on it, giving the ability for the machine to work inside as a zero emissions machine or outside as a rough terrain boom. The advantage of the machine as I was saying is it gives you the ability to work inside and outside as a rough terrain boom or zero emissions electric machine. We're a very environmental company and by putting a hybrid power plant on that, we're meeting all our environmental needs. To hire any one of our piece of equipment, please get on to Kennards. A versatile 4WD work platform with near vertical jib positioning. 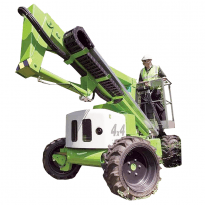 Features narrow access, proportional lift, swing and drive controls. Mobile Hydraulic Platform lift with a 10.2m platform height. 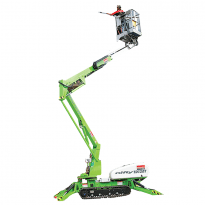 This articulated aerial platform has a wide range of applications due to the precise manoeuvrability of the boom. Mobile Hydraulic Platform lift with a platform height of 12.7m. 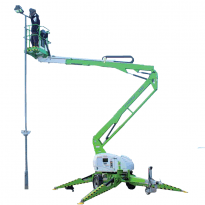 This articulated aerial platform has a wide range of applications due to the precise manoeuvrability of the boom. 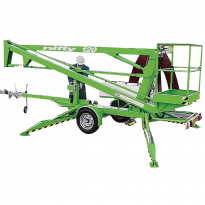 A light weight, self propelled boom lift, featuring smooth and accurate manoeuvrability and either diesel or battery operation. 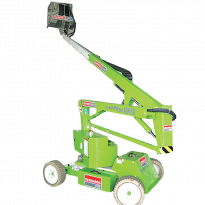 Also known as a Cherry Picker or Nifty Lifter, this is a compact and manoeuvrable, self propelled, elevating work platform that passes through a 1100mm opening.